This croft house and land have been in my husbands family for many years. His late great uncle kept his 'beasts' on this land and grew up in an original Skye black house - the site of which is now the drying area. Dualchas was originally built 80 years ago and has been refurbished within the last 6 years to provide, what is now, a cosy bolt hole for us. We have decided to extend the cottage by one room and work will start in Sep/Oct 18. We are very excited as this will give us more room and a beautiful picture window to enjoy the fabulous view. We hope that you will enjoy it too. As we stayed over Christmas Sheonagh had made the Croft really festive for us and our 2 children. We were warm and comfortable throughout our stay and slept really well! We explored a lot and the area is absolutely breathtaking, the children particularly enjoyed the dinosaur footprints on Staffin beach. Sheonagh has been really helpful answering any questions and made sure we enjoyed our stay. We would love to return one day. Great location, nice cottage. Good facilities. However, it’s listed as a 3 bedroom house which we needed, but only has 2 bedrooms. My mother had to cancel at the last minute which was lucky as when we arrived we were a bedroom short. I don’t know if this was an error on the Homestay website. But we had a great holiday, and come to this area every year. Hi Lynn, I am really sorry, if we had known you needed the extra room the sofa bed would have been made up for you. The extension planned for the cottage will allow us to put a permanent bed in the downstairs room whilst also giving us a much need separate lounge and dining kitchen. I hope that it didn't spoil your stay and that you will come back again next year. We mostly booked this house because of the location. There were so many things we wanted to see and do on the Trotternish peninsula. On top of the perfect location we found that the house was very comfortable and a nice place to come home to in the evenings. We loved having the sheep all around us and a couple of sheep dogs visited a few times. They barked a lot when meeting us but were very friendly. I suppose some renters would like to know that the smallest sheep dog can squeeze under the fence to the garden. We didn’t mind it at all. We had hoped to have internet but since the owner had written to us in advance that there were problems, we had downloaded some movies for the kids and even our autistic son managed being without it. I am so glad you enjoyed your stay - it is indeed a very beautiful part of the world. The internet is a source of frustration all over the island however I am glad that the lack of it did not spoil your holiday. I loved my stay at the crofter's cottage from the first minute to the last. 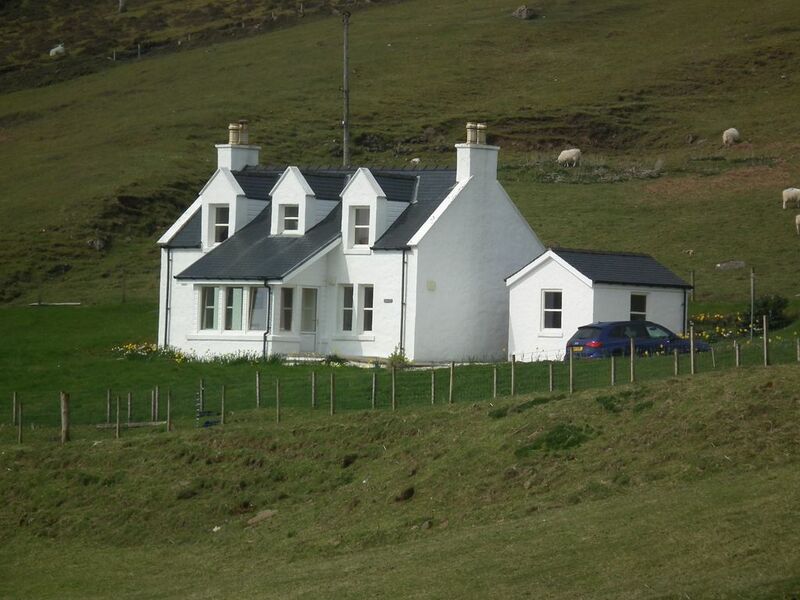 It is a lovely cottage, in very peaceful but dramatic surroundings. It is ideally placed for the northern and eastern aspects of Skye, being very close to The Quirang, The Old Man of Stor, and other attractions. It is very comfortable, and well kitted out, and very well looked after. Thank you Neil, glad you enjoyed your stay. Perfect location for all the good walks! The view is astonishing, especially when the sun rises in the morning. The cottage is lovely decorated and has everything you need. Only downfall is the WiFi and there is barely any mobile reception, but obviously that’s something you face on the whole island. We had an amazing time and would definitely come back! The sheeps and little lambs are right in front of your door-amazing! WiFi is very sporadic throughout the island and mobile signals come and go but that is part of the charm. Beautiful spot. Great scenery. The croft house was magnificent. Completely enjoyed our week. Everything about our stay was wonderful. Watching the sheep dog herding the sheep each evening was a highlight. The croft house had all of the amenities, including strong internet and hot showers. We enjoyed cooking dinner each evening as well. Skye is a beautiful island to explore. Why not go in search of the dinosaur's footprints on Staffin pier. There are many walks and there is a book to help you in the cottage. Dunvegan Castle is well worth a visit along with the local museum.